It’s hard to believe that a jazz drama with only two major characters could be one of the tensest, most exciting films of the year, but that is unquestionably the case with director Damien Chazelle’s Whiplash. When Andrew Neyman, a driven and ambitious 19-year-old music student, joins Terence Fletcher’s prestigious jazz band, his entire world narrows to the pursuit of success on the drums. At first glance, J.K. Simmons’ portrayal of Fletcher is reminiscent of a character that we’ve seen over and over again. He’s a hardened musician himself, an angry, lonely man who expects perfection and will scream curse words in the faces of his students and fling chairs at their heads to get it. But thanks to a nuanced performance by Simmons and a fresh script by Chazelle, Fletcher becomes much more than the common caricature. If Fletcher provides Whiplash with its strain and rigidity, it is Miles Teller’s Neyman who gives it some heart and soul. On paper, Neyman shouldn’t be a particularly likable character. He does everything with a haughty arrogance, he’s overwhelmingly self-centered, and he’s completely blinded by his passions. Still, there’s something endearing about Neyman’s dangerously reckless ambition, and Miles Teller proves impossible to hate. Both Simmons and Teller give performances that are sure to generate considerable Oscar buzz, and the attention will be well deserved. Whiplash succeeds only because its two leads succeed. Their relationship fuels the film, and the film’s weakest moments, which are admittedly still not very weak at all, come when these two are separated. It isn’t just the stars that impress in Whiplash. In his sophomore effort, Chazelle proves himself a masterful director. Every shot is deliberate and carefully chosen. Chazelle doesn’t just let us hear the pulsing jazz music; he lets us see it. As the drums pound and the emotions rise, the camera quickly snaps from shot to shot without giving viewers a moment to take a breath. Even with phenomenal performances and smart directorial choices, Chazelle’s screenplay is arguably Whiplash’s most impressive feat. 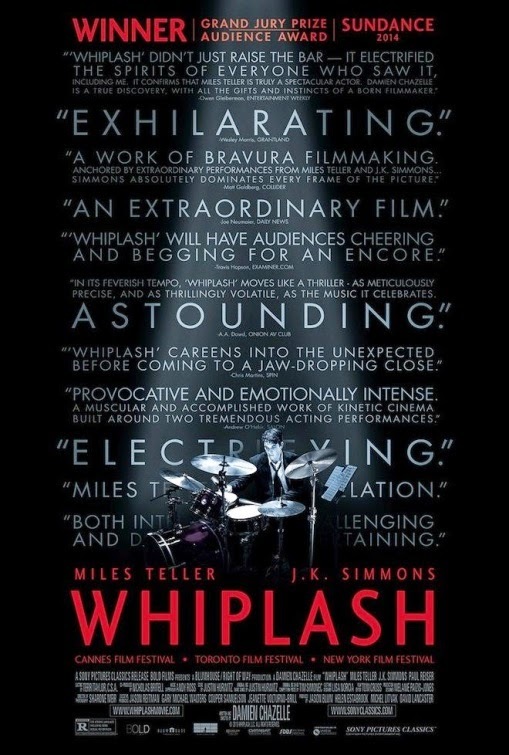 At a trim 106 minutes, every scene in Whiplash is important. There are no filler moments, and the film is all the better for it. Whiplash has the pacing of a beat-the-clock thriller, the ups and downs of a sports story, the tension and intelligence of a quiet drama, and the blood and tears of a war film.